There is a first time for everything, and this Christmas I have been the judge of a cake baking competition. Not that either baker knew they were competing. The two finalists were: a well known bakery/cake shop in Manchester, and a Deloitte colleague, Fallon Nolan. 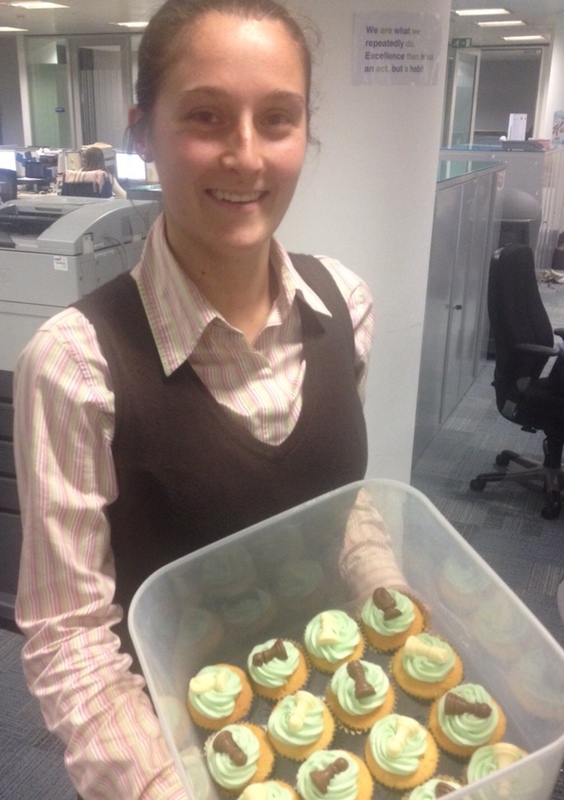 Fallon will be one of my most missed colleagues when I finally retire from Deloitte in a couple of days' time, since she is always baking for us (her caramel shortbread being my favourite). 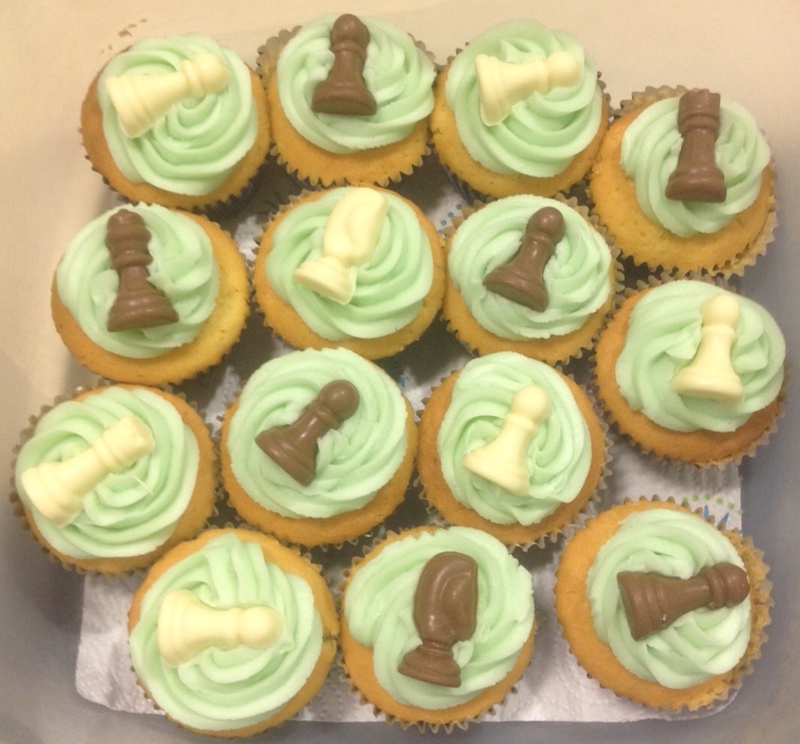 Somehow, my colleagues know that I have a slight interest in chess. First up, as a present after my leaving speech I was given this wonderful cake made by the (un)said well known bakery. 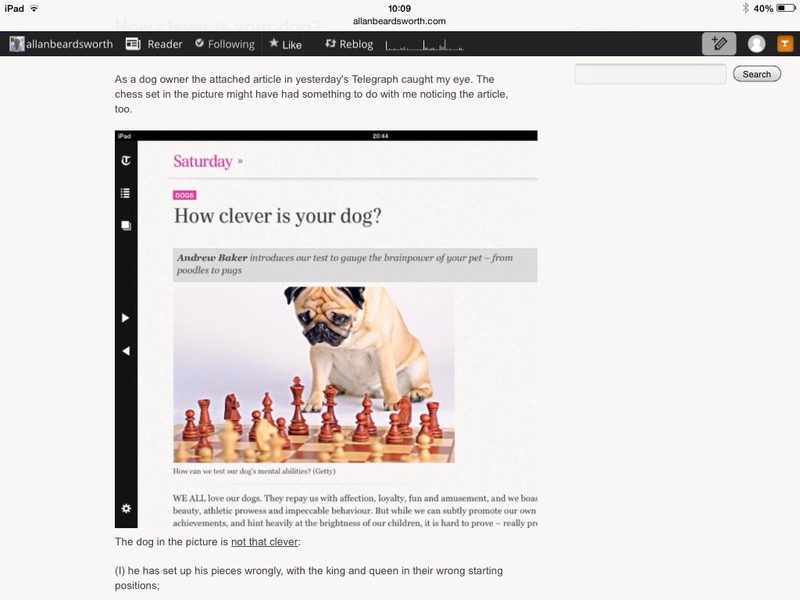 The astute reader might suspect favouritism, and might even be prepared to place a bet on who wins the Great British Chess Bake off. But no, in order to avoid bias, a scoring criterion was introduced: a series of technical bake and presentation questions. Was the board set up correctly? Key here, are there white squares on the right hand side. It would be minus many points if the right hand corner squares were black, something which often happens in films. Both bakers set the board up correctly. 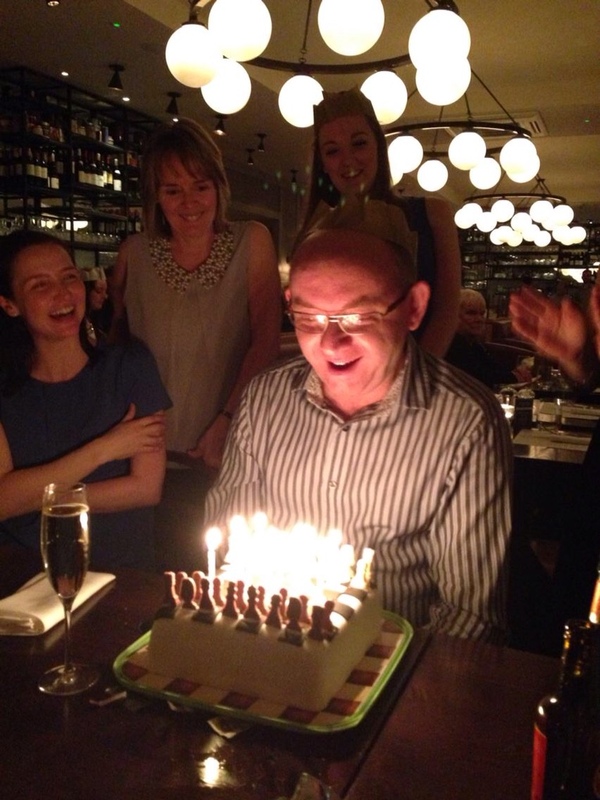 I have previously blogged (to my senior partner's ridicule, at my retirement dinner) about the ruinous effect of setting up the pieces in a random or incorrect manner. Again, both bakers did well. The shop's position is a bit chaotic and wouldn't appear in a Grandmaster game (white is winning, easily) but is legal, whilst Fallon opted for setting up the pieces in their opening positions. A slight plus on this count to Fallon, since she got all the pieces, including kings and queens, in their correct positions. Both were beautifully presented, with all the squares being square, everything as it should be. Compare the two photos. 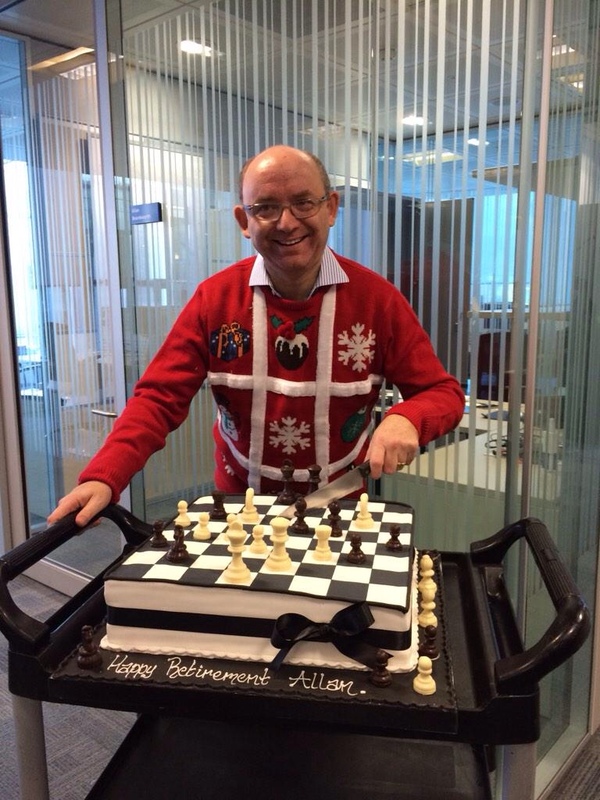 Slight edge on this count to the shop made cake, since the Friday was also Christmas jumper day. (Maybe illogical, but often Mary Berry and Paul Hollywood make their judgments for odd reasons). On my last Friday, numerous colleagues had a slice of the shop cake. Everyone agreed it was lovely, moist, nice cream and jam; and the icing was very good too. 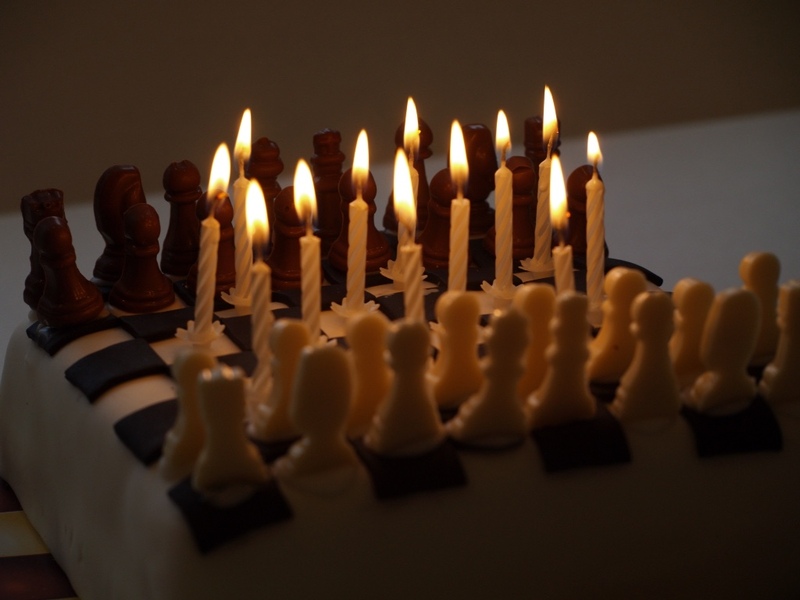 I took a big chunk of cake round to some close friends, and of course pieces home to share with the family: everyone agreed that the shop cake was of grandmaster standard. But Fallon's was even better: a 2800+ cake. 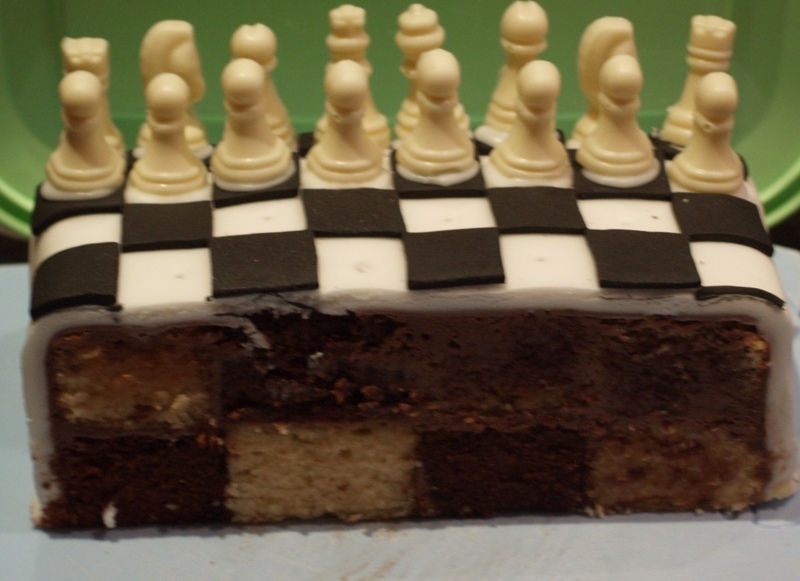 She had baked two different coloured cakes, and then cut and rebuilt them in checkerboard fashion. The darker, chocolately cake was perhaps the nicest cake I have ever had. 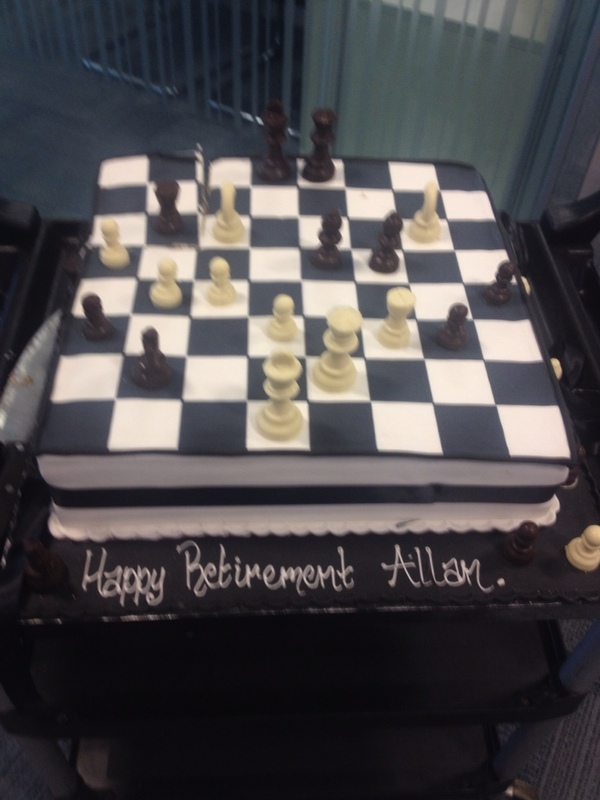 The shop bought cake had some nice 'happy retirement' writing, whilst Fallon also baked a couple of boxes of chess cup cakes for the department. The cream on these cakes was lovely, so Fallon pips it on this test, too. It was actually no contest. The shop made cake was enormous, beautifully presented, tasted gorgeous, but the winner due to the even better taste (the chocolate cake was sublime) and the extra cup cakes (a super grandmaster innovation) was Fallon. …and for good measure, Fallon is getting married to Tommy in two days time. Best of luck for the day and a lifetime of happiness together. I wonder if Fallon has baked her wedding cake?